Yet again, I have Rebecca at Foodie with Family to thank. She made roasted brussels sprouts with grapes and walnuts. The dish was delicious, but my favorite part by far — the revelation — was the roasted grapes. Ten minutes in a hot oven and ordinary red grapes become winey, supremely juicy, and complex, with subtle honey undertones. They’re fantastic all by their little selves, or with a handful of walnuts or pecans roasted alongside. I served the grapes as a side dish with braised chicken thighs; they’d also be delicious with ham or pork. I’ve actually eaten a bowl of them for lunch, simply accompanied by a wedge of good cheese and a few crackers. 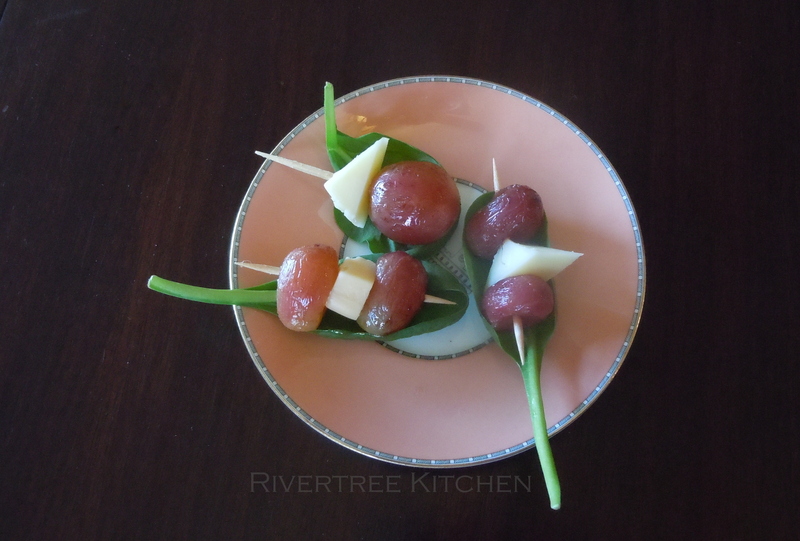 They’re also great as a surprising appetizer: one large or two small grapes skewered with a morsel of cheese. I used a Wisconsin Abergele, which is buttery soft with a hint of tang. I have yet to figure out how to make the skewers look pretty; I apologize for that. But the taste is a wine and cheese party on a stick. It gave me thoughts of a smear of gorgonzola on a toasted baguette slice, topped with a few halved roasted grapes. Or maybe a bit of sharp cheddar nestled in a tiny phyllo cup and topped with a roasted grape. Caveat: don’t eat them straight out of the oven unless you want to sear the taste buds right off your tongue — they’re filled with boiling juice. They’re tasty at room temperature, and heavenly when warm. Heat the oven to 400 degrees F. Line a cookie sheet with parchment or a silicon mat. Rinse the grapes, remove them from the stems, and dry gently but well. Toss them with the olive oil and balsamic vinegar and spread in one layer on the cookie sheet. Sprinkle lightly with salt and pepper. Roast for about 15 minutes, stirring once or twice, until the grapes are just slightly wrinkled and are smelling terrific. If you’re including nuts, stir them into the grapes after they’ve had about 5 minutes in the oven. Pour them into a serving dish and let rest for 10 minutes before serving, so you don’t get burned. You can add a pinch of coarse salt before serving for a salty crunch, if you wish. 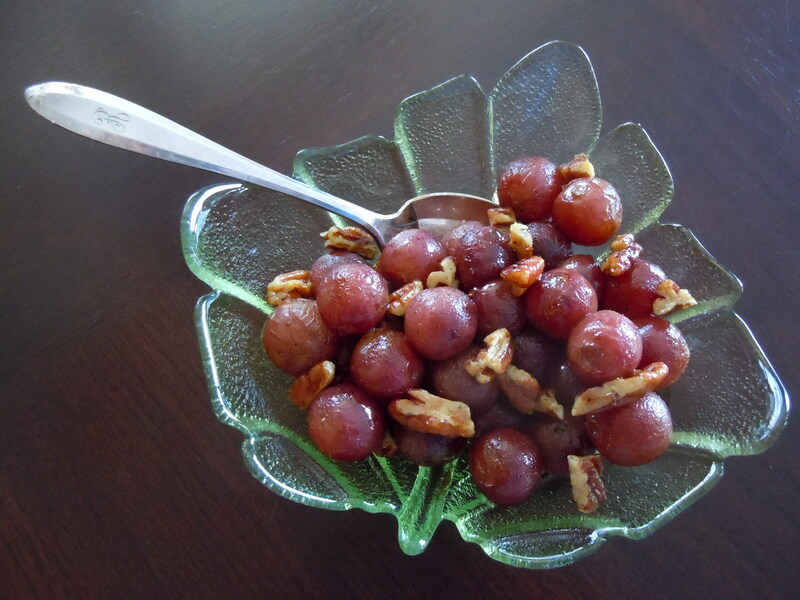 This entry was posted in appetizers, sides and tagged grapes, nuts, roasted, side dishes. Bookmark the permalink. We’ve made these a couple of times now … so good! They also hold up pretty well for a few days in the refrigerator, I’ve found. Keep their flavor, don’t mush too much. Good to know. Do you reheat them, or just let them warm to room temp? This sounds very good. I love grapes and as a matter of fact I am eating some right now. I often freeze the in the summer for a treat but have never roasted them. I shall do that now that I have this yummy recipe idea. Thanks. I love new ideas for fruits. I like pairing them with meats instead of vegetables all the time. Thanks! Daisy, I actually don’t usually like fruit with meat (although my husband and son do), but these seem to be less sweet and dessert-like.